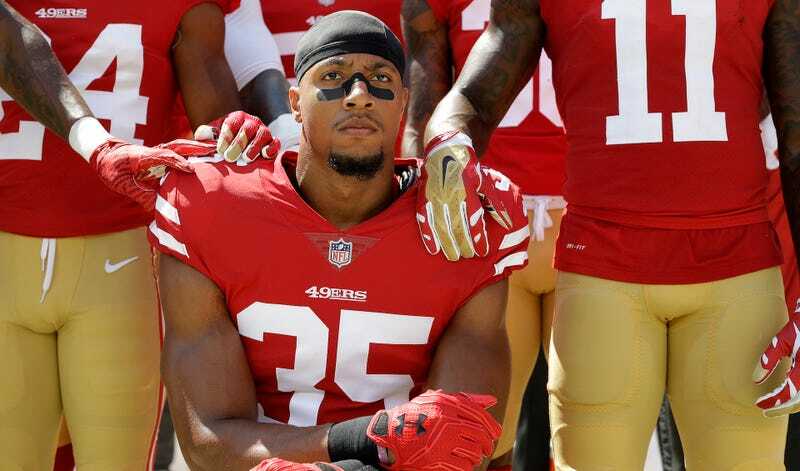 Free agent safety Eric Reid has filed a collusion grievance against the NFL and retained Mark Geragos, the same attorney who is also handling Colin Kaepernick’s collusion lawsuit. Reid began kneeling during the national anthem to protest racial inequality and police brutality during the 2016 season, and he continued last season after Kaepernick left the team. The news was first reported by ESPN’s Dan Graziano, and the NFLPA confirmed it shortly after with a statement of support for Reid. Reid became a free agent one week ago, and despite being one of the better safeties on the market, he’s been unable to find a team this offseason. The Bengals met with him, though they were acutely concerned over Reid’s kneeling, which Reid has already said he will not continue during the 2018 season. Reid has been critical of the NFL’s half-measures to allay player concerns, as well as NFL owners expressing pro-player sentiments in a closed-door meeting in October, yet still refusing to sign Kaepernick. When Reid spoke up at said meeting, he called the owners out for blackballing Kaepernick. Reid’s case will probably hew closely to Kaepernick’s, especially since he finds himself frozen out one week after calling out the people who froze out Kaepernick. They will have to prove not just passive collusion, but an active effort to keep Reid out of the league. Here is how the Collective Bargaining Agreement defines collusion (Section 1), as well as the burden of proof for establishing collusion (Section 6).